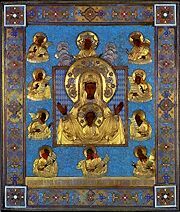 The foundation for the iconographic type, or composition, of the Icon of the Mother of God “of the Sign” are the words of Prophet Isaiah: “Therefore the Lord himself shall give you a sign; Behold, a virgin shall conceive, and bear a son, and shall call his name Immanuel” (Isaiah 7:14). n the 13th century, the Kursk region, as well as the rest of Russia at the time, was subjected to terrible decimation by the Tatar invasion. The city of Kursk was completely destroyed and grew into a wild, overgrown forest, populated by wild animals. The residents of the city of Ryl’sk, 90 versts (60 miles), who had somehow been spared from a Tatar invasion, would go there to hunt. And it happened that in 1295, on the feast day of the Nativity of the Mother of God, a small troupe of hunters from Ryl’sk arrived at the Tuskor River, 27 versts (18 miles) from Kursk, to hunt. One of them, a pious and honorable man, seeking prey in the woods, found a small icon lying face down at the root of a tree. He had barely lifted the icon from the ground to inspect it, when a strong wellspring of pure water burst forth from the very spot where the icon lay. The icon turned out to be of the Mother of God “of the Sign” type. The hunter realized that this was no ordinary icon. He summoned his fellow hunters, and together they cut down timber and erected a small chapel where they placed the newly-found icon. The people of Ryl’sk, learning of the icon, began to visit it for veneration, and many miracles occurred as a result. Prince Vasily Shemyak of Ryl’sk, having heard about this Icon, ordered that it be brought to his city, which was done with great ceremony: the entire city emerged to greet the miraculous Icon as it approached amidst a procession of the cross. Prince Vasily himself, however, declined to participate in the ceremony—and was struck blind. But after his earnest repentance and prayer before the Icon, he was granted sight again. In gratitude for this miracle, he built a church dedicated to the Nativity of the Mother of God in Ryl’sk, where the icon was then place, and where every year, on that feast day, the Icon is celebrated. But the icon did not stay in Ryl’sk for long. Three times it miraculously disappeared from Ryl’sk, and it would be found again and again at the site where the hunter found it. The people of Ryl’sk then understood that it was the will of the Mother of God that Her icon should remain at the site of its discovery, and they left it there permanently. In 1383, the Kursk region was once again subjected to looting by the Tatars. A band of them, coming across the chapel, took the attending priest prisoner and decided to burn the chapel down. But no matter what they tried, the chapel would not ignite. The superstitious Tatars then seized the priest and accused him of sorcery. The priest refuted their charge and pointed to the Icon inside the chapel. The livid Tatars seized the holy image, hacked it into two and threw the pieces away, then burned down the chapel. Fr Bogoliub was then taken away as a slave. But the priest stood fast to his Orthodox Christian faith even as a slave: despite the pressure the applied on him to adopt their religion, he remained unbowed, and lay all his hopes on God and His Most-Pure Mother. This hope was not futile: once, as he was tending to a flock of sheep, he sang a prayer to the Mother of God. A group of emissaries of the Muscovite prince, passing by on their way to see the khan, heard the singing and, learneing that this slave was a Russian priest, they ransomed him out of slavery. Fr Bogoliub then returned to his homeland and settled once more where the chapel had once stood. Soon thereafter he found the two pieces of the miracle-working Icon, and as he placed them together, they immediately, miraculously grew together. In 1597, by order of Tsar Feodor Ioannovich, the Icon was brought to Moscow and surrounded by depictions of the Lord Sabaoth and the Old Testament prophets who had foretold the selection, labors and service of the Most-Blessed Virgin Mary. In 1603, Pseudo-Dimitry I took the Icon from Kursk to his camp at Putivl’, then to Moscow, where it was kept in the royal palace. In 1615, by a special request by the people of Kursk, Tsar Mikhail Feodorovich commanded that the miracle-working Icon be returned from Moscow to Kursk and placed in the Kursk Cathedral. Tsarina Irina Feodorovna adorned the Icon with a bejeweled riza, after which it was returned to its chapel. That same year, with the help of the Tsar, a church dedicated to the Nativity of the Most-Holy Mother of God was erected on the site of the chapel, and a monastery founded there, while a second church was built over the original spring dedicated to the Life-Bearing Wellspring. The new monastery became known as the Root Hermitage in honor of the appearance of the Icon at the root of a tree. Since 1618, the Icon spent most of each year in Kursk, and would be brought to the Root Hermitage for a brief time. In 1676, the Icon was taken to the Don River to bless the Don Cossacks. In 1684, Tsars John and Peter Alexeevich sent a copy of the holy Icon to Kursk with the order that this copy accompany Orthodox warriors into battle. In 1687, the Icon was sent to the Great Army. In 1689, copies of the Icon were given to the armies heading for the Crimean Campaign. In 1812, a copy of the holy Icon was sent to General Kutuzov’s army. There have been many copies of the Kursk-Root Icon, some of which have also been glorified for working miracles. Since 1806, by Royal decree, the miracle-working Icon was to be kept at Kursk-Root Hermitage from the Friday of the 9th week after Pascha until September 12. During that period every year, the Icon would be brought from Kursk to the Kursk-Root Hermitage and then back with a solemn procession of the cross which traveled the entire way, totaling 27 versts (18 miles). Several horrifying events are connected with the miracle-working Icon in pre-Revolutionary Russia, for instance, the explosion of a hellish bomb inside Kursk Cathedral, the aim of which was destroy the holy image. The church was destroyed, yet the Icon remained whole. This terrible episode was explained years later in Frankfurt, Germany, where the Icon was brought. The priest accompanying the Icon, we learn from the book by Archbishop Seraphim (Ivanov, +1987) of Chicago and Detroit, Odigitrija russkogo zarubezhija [The Hodigitria of the Russian Diaspora], was taken aside by an old man, who said to him: “I was a cohort of [the terrorist] Ufimtsev in the attempt to blow up the Icon. I was a young man, and didn’t believe in God. I wanted to test whether God exists: if He does, He wouldn’t allow such a great holy icon to be destroyed. Afterwards, I began to fervently believe in God, and to this day I bitterly repent in my terrible act.” The old man prostrated himself before the Icon and left the church. Now a few words about Archbishop Feofan of Kursk and Oboyansk, who brought the Icon abroad, and thanks to whom this holy image was saved from desecration by the Bolsheviks. Vladyka Feofan (Gavrilov) was born on December 26, 1872, in the Orlov Diocese to a clerical family. In 1893, he graduated from Orel Seminary, and in 1897, ordained to the priesthood. In 1902, he enrolled in Kiev Theological Academy, where he was tonsured a monk. Finishing the Academy in 1906 with a Master’s degree, Fr Feofan was appointed Deputy Inspector of Bezhetsk Theology School. In 1908, he was appointed Inspector of Volhyn’ Seminary, and in 1910, became the Rector of Vitebsk Seminary. In December 1913, he was consecrated to the episcopacy in the Cathedral of the Mother of God of the Sign in Kursk as Bishop of Ryl’sk, Vicar Bishop of Kursk and Oboyan’. The new bishop loved to serve in Kazan Cathedral in Kursk, the cornerstone of which had been blessed by St Ioasaf of Belgorod in 1752. Servant of God Isidor, the father of St Seraphim of Sarov, helped build this church. On the 9th Friday after Pascha of 1767, in the Mashnin courtyard (the family of the future saint), which was located near the church, the young Prokhor was miraculously cured by the Kursk Icon. It is interesting to note that in the lower church of the Kazan Cathedral, dedicated to St Sergius of Radonezh, there is a lifetime portrait of St Seraphim sent by Hegumen Nifont of Sarov Hermitage to his brother Alexei, with news of the repose of the miracle-worker. On Wednesday of the 6th week of Great Lent, pre-sanctified Liturgy was celebrated by Hieromonk Germogen (Zolenko, who died as an archimandrite in the Holy Land in 1958). Returning to the church for great compline, he saw Hieromonk Pitirim at the Cathedral entrance along with the monastery’s ogarochnik, a novice responsible for the collection of candle stubs, who had discovered the theft of the miracle-working Icon, the Holy Lamb (the Gifts prepared for pre-sanctified Liturgy) and the gold tabernacle. The alarmed monastic brethren immediately reported this to Vladyka Feofan, who sent a telegram to the head of the Moscow criminal investigation department. The local atheists were not questioned, and the blame was laid at the feet of the monks themselves, including Vladyka Feofan, who were all placed under house arrest. So the monks of Znamensky Monastery, having lost their most prized holy icon, were faced to greet Pascha with some sorrow. But the Resurrected Christ brought consolation to the brethren, for on the Thursday after St Thomas Sunday, a homeless man found the Icon, but without the valuable riza, near Theodosius’ well. This well, tradition had it, was dug out by the Hegumen of the Kievo-Pechersky Lavra himself, St Theodosius, on whose very feast day the Icon was found. It is therefore noteworthy that the miracle-worker of the Kiev monastery seems to have participated in interceding for his fellow countrymen. Learning of the finding of the Icon, Bishop Feofan ordered that all the bells be rung, and set out on a procession of the cross with all the monks to the site where the miraculous Icon was found. Soon after Kursk was seized by the Volunteer (White) Army in September 1919, they found two gold icon-holders from the Kursk Icon in the offices of the Cheka (Bolshevik secret police). The rejoicing, grateful people of Kursk began a constant stream of prayers before the Icon, knowing that it would soon leave their city. Vladyka Feofan, fearing the desecration of the Icon by the advancing godless forces, left Kursk on November 18, 1919, carrying in his hands the miracle-working Icon. In 1920, the Icon was finally brought out of its homeland by Vladyka Feofan. In 1925, by decision of the Synod of Bishops Abroad, and with the consent of the keeper of the Icon, Archbishop Feofan, the Hodigitria of the Diaspora was taken to the Russian Holy Trinity Church in Belgrade. After the Germans occupied Yugoslavia, Archbishop Feofan took the Icon to Hopovo Monastery. Soon afterwards, Archbishop Feofan was left Croatia for Belgrade, where he lived in great need until the end of his life, in 1943. It is noteworthy that it was before this very icon that the great St John (Maximovich) of Shanghai and San Francisco the Miracle-worker, died in 1966. Let us thank the Lord, Who has given us this great holy Icon of the Mother of God, Who illuminates all the church events and celebrations of the Russian Orthodox Church Outside of Russia and shows us the path in today’s world.